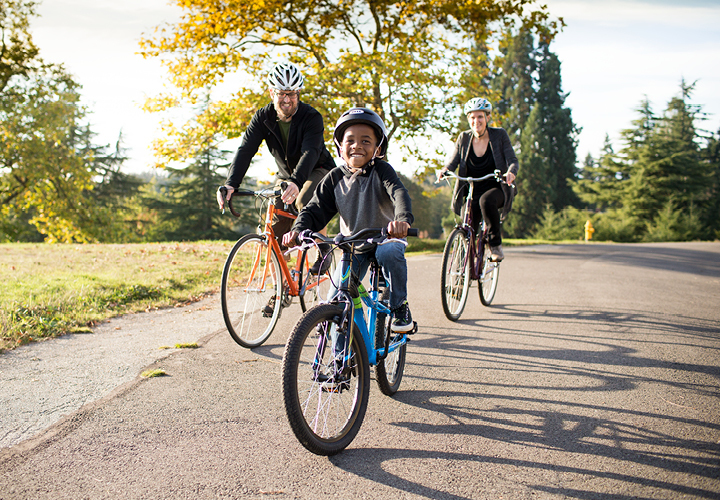 Biking with young kids can be a fun bonding activity, even in winter. Some rules of thumb: dress warmly, ride slowly, and have a plan B for bad weather. To safely ride with kids too young to ride their own bike, you’ll need a trailer or a bike seat. Infants should be old enough to sit up unsupported; The American Academy of Pediatrics recommends waiting until your child is 12 months old before putting him or her in a trailer or bike seat. Stay upright if you happen to fall, unlike bike seats. Allow you to tuck in a blanket, toys, and snacks to keep little ones comfy. Usually have flaps you can zip shut to shield kids from the elements. Make your bike wider and longer, which may be a concern if you’re riding in traffic or without a dedicated bike lane. Make it easier to make conversation while you ride. Allow kids to see more since they sit up high on the bike. May feel safer to use in traffic because they take up less space than a trailer. Will negatively affect the handling of your bike in a way that a trailer will not, so practice with a load before you ride with your kid. Swap out clipless pedals for flat pedals so you can wear boots. Install studded tires or snow chains (yes, these exist for bikes too!) if you’ll be riding on snow or ice. Install full fenders to keep grit and road spray off you and your passengers. Strap a helmet onto everyone aboard. Put a bright white light on your handlebar or helmet and a red light on the back of your bike so you can be seen by drivers in low-light conditions. Bring a lock so you can secure your bike at your destination. A safety vest or reflective clothing. These items aren’t just for riding in the dark — they’ll also increase your visibility on gray days. A wool base layer and a wind- or rainproof jacket will get you through many winter days in milder climates. Add a balaclava, a hat, long johns, wool socks, warm boots, and thermal gloves as temps drop. In rainy weather, consider choosing waterproof-breathable or water-resistant jackets and pants over fully waterproof items. You might find you’re more comfortable getting a little wet from rain versus drenched from sweat. 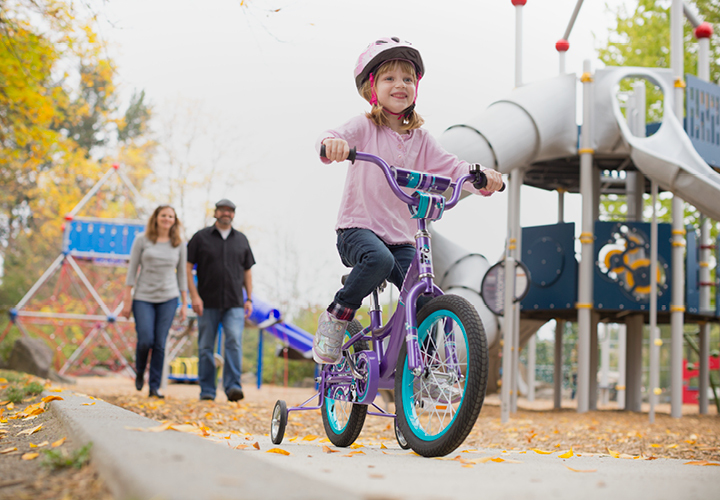 Whatever you wear, give your kids an extra layer since they won’t have the advantage of pedaling to stay warm. If you wear gloves, give them mittens. If you wear rain pants, put them in snow pants. If they’re in a trailer, tuck a blanket around them and check on them from time to time. 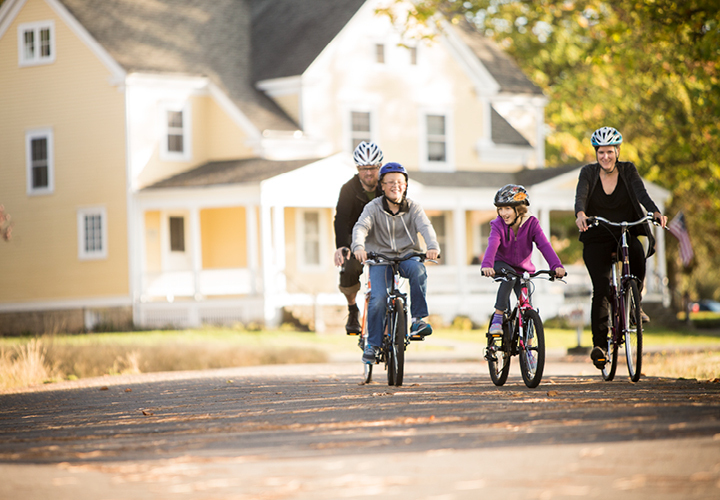 Pick a destination or a stop along the way so kids can warm up off the bike and explore. Pack a thermos of hot chocolate or hot tea with milk and honey to sip when you stop. With the right preparation and planning, winter bike adventures might become a favorite activity for your family!